The first of our gemmilicious workshops got off to a flying start with our students exploring all stones green, before learning to make a tension set ring. I love that each ring carries the maker’s personality. 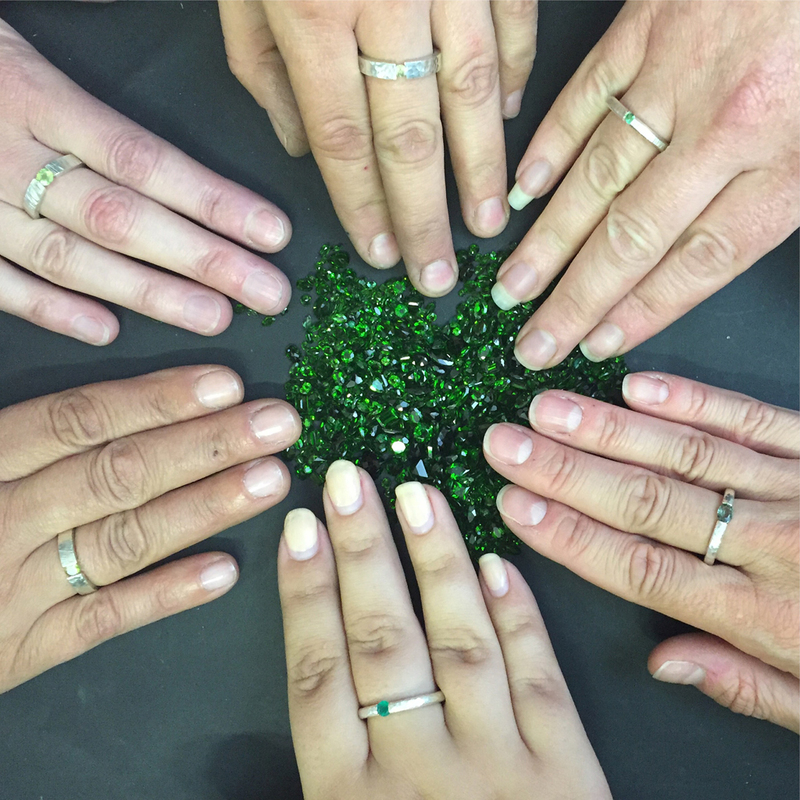 We introduced students to a wide range of green gemstones. From emerald to peridot, dioptase, to prehnite, prasiolite, flourite and green sapphire, green stones abound. Some of these stones are easily identified by colour alone. But to the untrained eye, additional tools are required to assist. Using a refractometer we showed students how to identify the refractive index of each type of stone. The thermal test is also used in assessing which family a stone belongs to. Green gems of the beryl, quartz, garnet, and spinel families all have different thermal-conduction properties, and although the thermal test cannot give the definitive identity, more clues can be garnered. With additional examination through the loupe and then the microscope our collection of green stones revealed other clues to their origin. Students could see the tell-tale inclusions (fissures) almost always evident in emeralds, and the gel – like quality of prehnite’s structure. Needless to say, having learned of the fractious and brittle nature of emeralds, none of our students wanted to risk choosing this for their tension set-ring. We showed students how to measure, cut, hammer and coax their silver bars into their perfect fitting ring. The final element of sheer brute force made peridot, green sapphire and green garnet the popular choice. Next up, we explore the delights of blue to purple hued stones. And finally, for the pearl fans we have a fabulous day with Perfect Pearls. Tagged Barbora Rybarova, Classes, Courses, Elena Timbaliuc, stone setting, weekend, Workshops. Bookmark the permalink.